I was playing around on one of my characters on Landroval today, and decided to run a skirmish to get some quick experience. 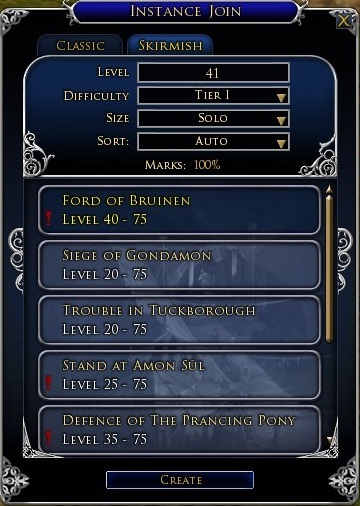 As most of us know, the daily skirmish bonus alone can be over half a level in the 20-30 level range. I used the instance finder, and eventually I was grouped with another player, and we ran Trouble In Tuckborough. Imagine my suprise when we got to the end, and there was no daily skirmish bonus! I thought it may be due to the fact that I used the instance finder, but I checked it on a few other characters as well. The ring in the instance join panel used to mark which skirmishes may still be completed for the daily bonus is no longer there. I truly hope that this does not mean that daily skirmishes are gone, that was the only reason I ran them before level cap. Apparently they slipped this one by us with Update 5, and let me say, this is one change that I am not happy about. Hi there, daily quests are gone but you may be happy to know that we’re still gaining the reputation and experience they used to give (it’s just exp is now scattered around in mob kills) or.. Well, that is how it is supposed to work. The mark bonus on the other side is now for the instance finder only. THAT, seeing the poor implementation of the tool, is a real shame.